Comments: This was really just a quick test to see if all my equipment was working after the trip down to the south of France. The Heart Nebula, IC 1805, lies some 7500 light years away from Earth and is located in the Perseus arm of the Galaxy in the constellation Cassiopeia. This is an emission nebula showing glowing gas and darker dust lanes. The nebula is formed by plasma of ionized hydrogen and free electrons. The very brightest part of this nebula is separately classified as NGC 896, because it was the first part of this nebula to be discovered. 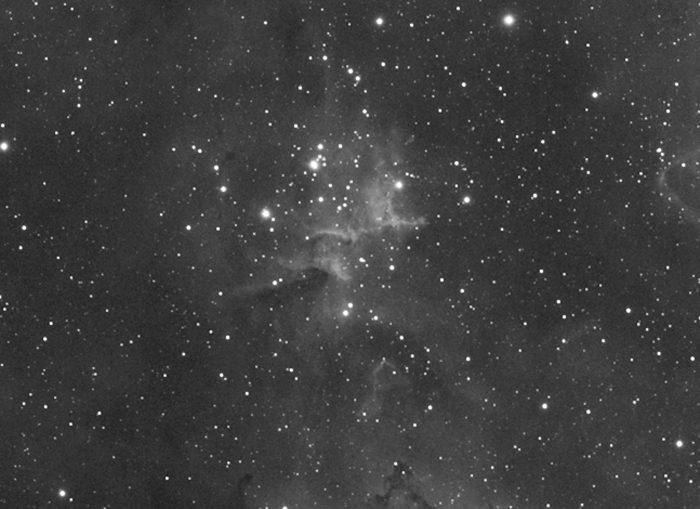 My image shows only a very small part of the centre of this nebula.